Is there anything that can prepare you for watching Kyle Maclachlan’s Special Agent Dale Cooper fall through the floor of the Black Lodge and hurtle through space, which resembles the outer-temporal and spatial beginning of Lynch’s Eraserhead? I don’t think so. Or at least, I wasn’t prepared for the first two hours of Twin Peaks’s reappearance. The hallucinatory quality of witnessing this scene again over twenty-five years later can’t be overstated. 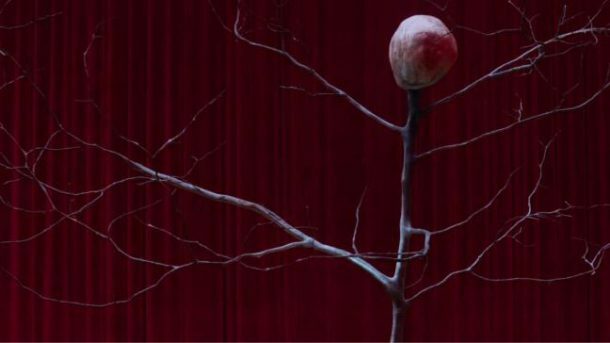 In returning to the world of Twin Peaks, David Lynch and Mark Frost not only threw the characters back into a surrealistic time warp, but they did it to the viewers too. Part 1 starts, after the credits, with Cooper, again looking confused, as The Giant implores him to “listen to the sounds,” which are some scratching repetitive noise on a vintage gramophone. Along with this scratching, all of the episodes are overlaid with, as the closed captions read, “atmospheric whooshing.” Reminiscent of Lynch’s ambient album The Air Is On Fire, it gives a sense that all these various and random seeming scenes are a part of the same psychic fabric. And this helps because Twin Peaks: The Return isn’t only relegated to the town of Twin Peaks anymore. It’s horror has spread into South Dakota and New York City. In the original Twin Peaks, the foggy wooden landscape became almost a character itself, imbuing the two seasons with a sense of claustrophobia and a hint that something might be beyond the trees. In Chris Rodley’s Lynch on Lynch, Lynch explains his fascination with the woods: “For as long as anybody can remember, woods have been mysterious places” (162). 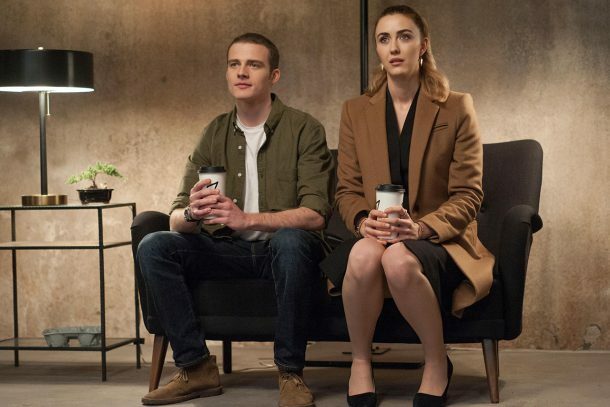 But here, Lynch sets his sights wider as the first episode switches to New York City and a bizarre industrial room with a portal inside a glass box where Sam, a mistaken college student took a job staring into the box all night. New York might seem like an unlikely locale for Lynch, who tends to prefer placing his particular brand of lunacy in small towns or sprawling Los Angeles. But, Lynch has referred to the hellishness of New York before. In an interview with David Breskin in 1990 (archived in the book David Lynch: Interviews), Lynch describes the terror of New York, “In a large city, I realized there was a large amount of fear, because so many people were living close together. You could feel it in the air. I think people in the city obviously get used to it, but to come into it from the Northwest it kind of hits you like a train. Like a subway…In fact, going into the subway, I felt I was really going down into hell. As I went down the steps, going deeper into it, I realized it was almost as difficult to back up and get out of it as to go forward and go through with this ride. It was the total fear of the unknown–the wind from those trains, the sounds, the smells, and the different light and mood–that was really special in a traumatic way” (62). I know how you feel, David. Really special in a traumatic way could probably best describe Sam’s storyline with his thirsty friend Tracey who desperately wants to see what’s in the secret room, as well as jump Sam’s bones. Their dialogue together is stilted and awkward, lending itself to the unreal feeling that pervades the first two episodes. “Now, I’m so curious you’re driving me crazy,” she deadpans. Later, after Tracey and Sam boink in front of the giant camera/portal to nowhere/panopticon/etc., a deeply disturbing anthropomorphic figure suddenly appears looking like the baby from Eraserhead all grow-ed up and bloodily slashes up both Sam and Tracey. What fun! The plot also turns toward South Dakota where Cooper’s evil doppelgänger Mr. C with hilarious hair and a serious attitude problem drives around with some unsavory characters. There’s also another grisly murder that seems to involve former 90’s teen movie star Matthew Lillard. This isn’t to say that the quintessential mountainous landscape of Twin Peaks doesn’t play a role. It does. In Part 2, we see Deputy Chief Hawk wandering through the woods at the beckoning call of the Log Lady (“Something is missing and you have to find it”) with long shots of his flashlight hitting the trees, just before a haunting vision of the symbolic red curtain of the Black Lodge appears. Of course, the Black Lodge takes center stage as always. Who can resist its red, white and black pull? I know I can’t. In a press conference about Twin Peaks: Fire Walk With Me, Lynch explains, “Well, for me, and I think for pretty much everybody that’s ever been, there’s a feeling that there might be something like subatomic particles existing that we can’t see and x-rays and maybe a few other things out there and that a little opening could exist and we could go somewhere else. And this kind of idea excites me” (144). Later, after Cooper witnesses a white horse and wanders aimlessly around the Black Lodge some more, he runs into the creature again as it yells “NONEXISTENT!! !” And Cooper flies through space and time only to float into the portal box in New York City. And who appears onscreen afterward? Oh Sam and Tracey who you thought were dead. Clearly, the first two episodes are completely inaccessible. I assume most of the hipsters that go to Twin Peaks-themed burlesque shows wanted more folksy camping about coffee, pie and donuts, not two hours of viscerally realistic existential terror. This is Lynch at his most potent and uncompromising. But, for me, this is what I had not only hoped for, but prayed for. I wanted Laura Palmer screaming in the Black Lodge for 18 episodes and I only had to wait until the second episode to see her wild screeching as she got sucked up to god knows where. That Laura is always so elusive. In fact, the show seems so referential to Lynch’s other works, including his paintings, that it feels like his manifesto–a culmination of every creative work he’s made, proving that all these visions from the Black Lodge to Club Silencio to Laura Dern’s face ripping apart in Inland Empire all leads to the same place. Does it make any narrative sense? Maybe not. But, it doesn’t matter. As Lynch says to David Breskin, “Life is very, very complicated and so films should be allowed to be too. That’s more the way it is” (82). And this would all be enough to make me salivate with nihilistic glee but Part 2 finishes at the Bang Bang Bar with Chromatics, acting as heirs to Julee Cruise’s throne, crooning “Shadow,” a song with lyrics that seem to reflect Cooper’s disappearing act (“We’re watching all the street lights fade/And now you’re just a stranger’s dream/I took your picture from the frame/And now you’re nothing like you seem”). We are also treated to a type of remembrance or a reunion of Shelly with her girlfriends as they do tequila shots and James, wearing his eponymous motorcycle jacket. “James is cool, he’s always been cool,” opines Shelly. He sure is. Is this what love is like? Shelly too spots a man who shoots her a glance, behind him is the creepy bartender that some will recognize from the original Twin Peaks. Did anyone in this town ever change jobs? 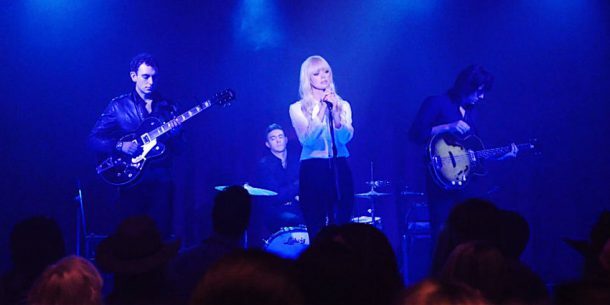 Between all this horror, though, we’re treated to the finale Chromatics’s torch song and dance–a return to the Bang Bang bar–like the record constantly spinning around and around at the end of Part 1. As Lynch remarked in his interview with Breskin, “In the meantime, there’s suffering and darkness and confusion and absurdities, and it’s people kind of going in circles. It’s fantastic. It’s like a strange carnival: it’s a lot of fun, but a lot of pain” (80). Tags: Bang Bang Bar, Chromatics, David Lynch, doppleganger, Laura Palmer, Lynch on Lynch, Mark Frost, Showtime, The Black Lodge, Twin Peaks, Twin Peaks: The Return. Bookmark the permalink.